The Medusa was a fun model to paint and allowed my to try out some of the new technical paints that GW released just before christmas. Her rules however are lacklustre at best and the Bloodwrack Shrine is a rather useless option in comparison to the awesome Cauldron of Blood. The model however is still very nice and surprisingly the first in many years to be produced by GW with a bare breast. I decided that I would base the mirror separately to use for display purposes as I thought it was such a great looking piece. I only wish that my non-metallic metal skills were better otherwise I could have really cool paint job, alas I went for a rather simple and dull frame that serves to frame the bright, mirrored section. 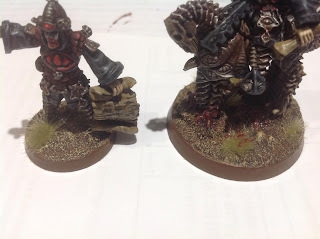 On this model I used the new 'Nurgle's Rot' and 'Blood for the Blood God' paints to simulate slime and blood respectively to great effect. I am slowly falling in love with the blood paint and my brother is threatening to ban me from using it, you get some consistently good gore that is really easy to apply. The Nurgle's Rot is also great for producing suitably slimy textures though I don't think it shall see much use as none of my armies really lend themselves towards having such an effect. I have been very busy these past few weeks for various reasons so haven't had the chance to paint much, hence why I am still posting stuff I painted over christmas. Things have started to settle down for me now so I should be able to start getting to work on my Vampire Counts sometime soon. I have also started working out how I am going to reorganise my Dark Eldar army. I don't think any of it will be sold but a fair bit will be repurposed for my Dark Elves and the Inquisition whilst the remainder will be transformed into a more Haemonculi themed force. This perhaps will require a new colour scheme of which I have several ideas. My Inquisitorial forces are also going to get a serious looking-at some time soon as I finally get around to updating my Witch Hunter war bands into something better resembling how Inquisitors and their Henchmen are now fielded. Expect more posts about things I painted over christmas, seriously I painted loads, for the next few weeks and then hopefully I should have some new things to show you.